Juliana is the oldest Alpine botanical garden in a natural environment in Slovenian territory. It was founded in 1926 by Albert Bois de Chesne (1871-1953), a proprieter from Trieste. He was counselled by his mountaineering friend Julius Kugy. A walk through the garden was meant to be a walk from the valleys to our mountain peaks. The garden, which covers 2,572 m2, is situated on the slope of Kukla in the Trenta Valley, near the Church of St. Mary at an altitude of some 800 metres, with the Soča River flowing few tens of metres below. After Word War II, the garden was taken care of by Slovenian botanists under the professional leadership of Dr Angela Piskernik. In1949, it began to be regularly maintained by the Slovenian Museum of Natural History, which finally took it over in 1962. Juliana has been officially protected since 1951. 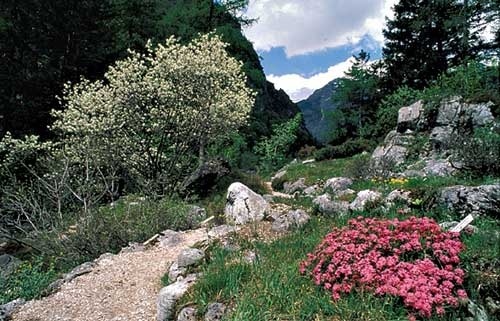 Owing to the low altitude and strong influence of the Mediterranean climate, which reaches the area through the Soča Valley, many high-montane plants do not thrive here. Much effort and love was thus needed in order for the garden to grow and flourish. Today, about 600 different plant species prosper in the garden, including endemites that are known to grow solely in Slovenia. From other Alpine botanical gardens in Europe, Juliana differs by its mixture of Alpine and karst species. Information about locality, entrance fees etc.